BabyNaturopathics.com - Erzi Brown Eggs Wooden Play Food Toy - Baby Naturopathics Inc. Your child can place�these cute wooden brown eggs in a toy fridge, wire basket, a nest made of straw or paper, or on the play�table for breakfast. 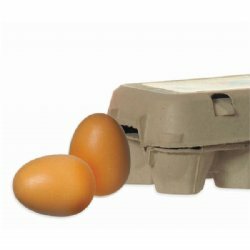 The six eggs come in a cardboard carton. Erzi wooden toys are colored with safe, foodgrade dyes. Brown Eggs are made in Germany. Erzi Eggs also come in colored and white.